I love nail polish. I have maybe 70 bottles of various shades and brands. I discovered a new brand, Sinful Colors. I found this at Rite Aid for only 1.99. It's my new favorite brand. I have 6 different hades of this brand now and at 1.99 I am sure I will be buying more. When I buy polish I have a list of things I look for. It has to go on in 1 coat (although I do always do a second coat). It has to be a fun color. Usually that means it is a blue, purple or green, but not necessarily. It has to hold up without chipping for several days. It also can't take forever to dry. 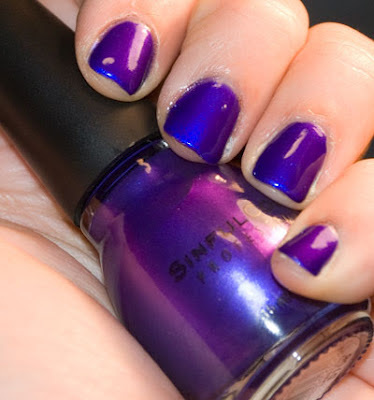 Sinful Colors does this easily. It also has the benefit of not being 5 or 6 dollars like other brands of their quality. I am so in love with this brand that I am tempted to throw out all of my other brands and filling my shelf with just Sinful Colors. It fits all of my criteria for the perfect polish. The colors are , it is a one coat polish that lasts and lasts and dries fast.